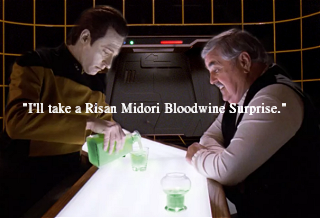 However, the holographic replicator still needs thorough testing - and what better time to do it than running a challenge during the preparations for St. Patrick's Day? - During specific times this Friday, the Holodeck will open. - In there, you may submit your beverages for testing. - This is done by logging them with the bartender. - Even Holograms have cravings, which they will let you know. - Anything that fits the demand goes, alcoholic or not. - Dusting off your green outfit may help with points. - Nobody is required to drink their creations for real. * Disclaimer: When the poisoning levels (especially alcohol and/or chocolate) become too high, a full reboot will be required.